Hi, my name is Linda Evans. 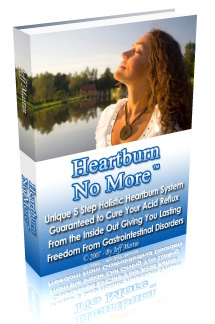 I developed a severe and troublesome acid reflux condition about 10 years ago. Symptoms manifested during the day but mostly came at night while I was asleep. I would wake up suddenly with a mouth full of acid. The next day, aside from feeling horrible from the lost sleep, I used to experience a feeling similar to being poisoned. Other related symptoms I experienced include but were not limited to: Pain and discomfort in the chest and upper abdomen, fullness in the stomach, nausea after eating, regurgitation, trouble swallowing, burping and chronic sore throat. Throughout this time I was prescribed several medicines such as Prevacid that provided nothing more than a temporary relief. I also took over-the-counter antacids like Tums. I must've swallowed hundreds of bottles of the stuff. I tried many expensive GI health supplements but they only provided short-term relief. They certainly did not solve the problem. Last year, I experienced a severe acid reflux attack and went to the emergency room. They doubled my Prevacid prescription and told me to avoid the usual foods I was already avoiding. I had an upper GI and Endoscopy performed. The physician read the results. The conclusion: I had Acid Reflux and he advised I should be on Prevacid for the rest of my life. This was completely unacceptable. I already avoided the usual acid reflux triggering foods, I slept with my bed elevated at the head and I lay on my side, but the doubled up dose of Prevacid was no longer working! I was going out of my mind. In my 'quest for a cure' I stumbled upon a website created by a nutritionist named Jeff Martin. 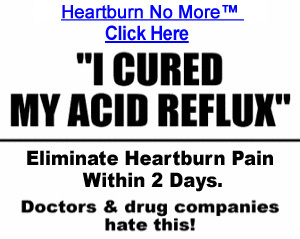 He claimed to have suffered from acid reflux and digestive disorders for eleven years until he discovered a unique holistic solution for all types of acid reflux and digestive disorders. Based on his website it appeared Jeff was honest and knew what he was talking about. Anything was worth a shot at this point so I bought the book right away. It is important to note that before I bought Jeff's program, I tried numerous anti-reflux diets, took herbal supplements, tried Chinese medicine, reflexology, homeopathy remedies, Threelac -- you name it -- but nothing worked! If you're having doubts, I can assure you that Jeff's program is unlike anything you have ever seen. I followed Jeff's instructions step by step. The results were almost instantaneous! After two days I felt a major relief. I was down to one Prevacid a day one week after I started the program. I was completely off Prevacid and Tums three weeks after. I remember for the first several days that I actually felt worse because my body was going through such a cleansing process and the die-off effects started to manifest. But boy, was that ever rewarding. I was euphoric, just knowing that I was finally on the right path to recovery. About 27 days into the program I was visibly healthier, my acid reflux and all its related symptoms were gone. It was the closet thing to a miracle that I have ever experienced. Six weeks into the program, I had made a SIGNIFICANT progress. I felt rejuvenated, energized, happier and so much healthier. I am a totally different person today. I have lots of energy. I have no acid reflux or any digestive disorders whatsoever. I sleep through the night. I wake up alert and full of life. Please write to me if you need encouragement and if you're looking for a cure, a REAL cure for your acid reflux, make sure you visit Jeff Martin's website by clicking on the link below.